As your kids grow, you want only the very best for them...so do we. That's why Earth's Best has introduced Tots Cereal Bars. Our delicious cereal bars are made with organic wheat flour (grown without potentially harmful pesticides or herbicides), no genetically engineered ingredients, and artificial colors or preservatives. Fortified with Calcium, Iron, Zinc and Vitamin B Complex, Tots Cereal Bars are especially made for the healthy development of growing children. In kids' favorite varieties such as Cherry, Strawberry Banana, and Peanut Butter & Strawberry, they are perfectly shaped for little hands and individually wrapped to keep up with even your fastest toddler on the go! 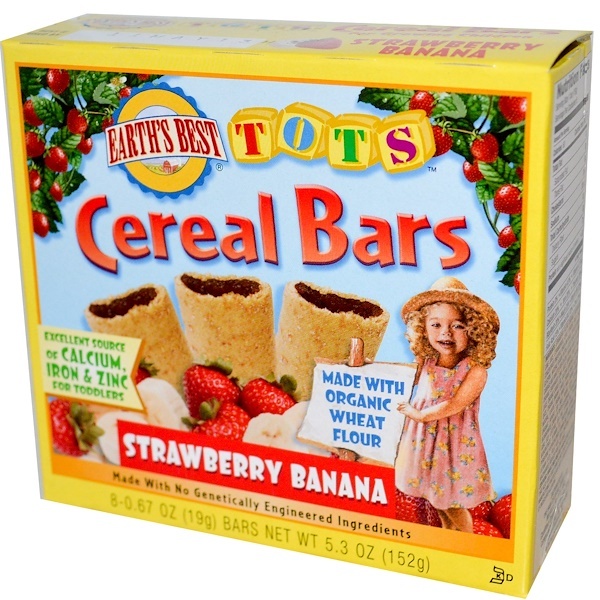 For a fruity combination that is bursting with bananas and sweet strawberries, bite into Earth's Best Tots Strawberry Banana Cereal Bars. Taste the fabulous combination of yummy fruit filling exploding in our deliciously chewy crust, made with organic wheat flour! 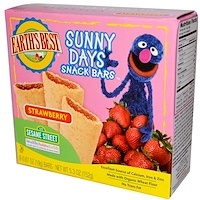 Wholesome to eat and convenient to carry, they are a natural recipe for snacking no toddler, or parent, can resist! Earth's Best Tots Cereal Bars are a part of the "Bread, Cereal, Rice & Pasta Group". 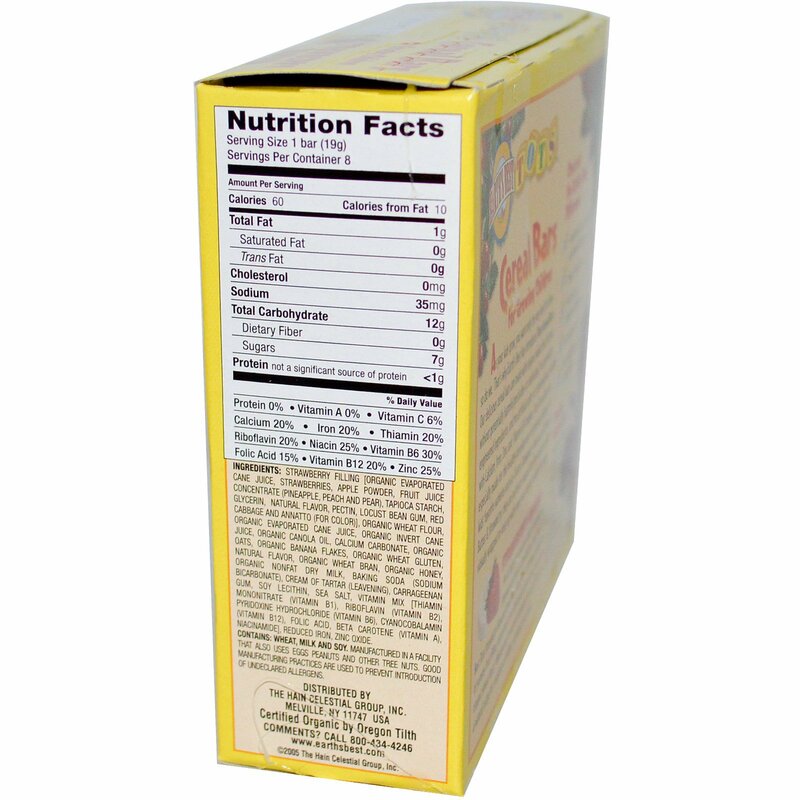 It is recommended that children get 6 servings from this important category each day. Strawberry filling [organic evaporated cane juice, strawberries, apple powder, fruit juice concentrate (pineapple, peach and pear), tapioca starch, glycerin, natural flavor, pectin, locust bean gum, red cabbage and annatto (for color)] organic wheat flour, organic evaporated cane juice, organic invert cane juice, organic canola oil, calcium carbonate, organic oats, organic banana flakes, organic wheat gluten, natural flavor, organic wheat bran, organic honey, organic nonfat dry milk, baking soda (sodium bicarbonate), cream of tartar (leavening), carrageenan gum, soy lecithin, sea salt, vitamin mix [thiamin mononitrate (vitamin B1), riboflavin (vitamin B2), pyridoxine hydrochloride (vitamin B6), cyanocobalamin (vitamin B12), folic acid, beta carotene (vitamin A), niacinamide], reduced iron, zinc oxide. Contains: Wheat, milk and soy. Manufactured in a facility that also uses eggs, peanuts and other tree nuts. Good manufacturing practices are used to prevent introduction of undeclared allergens.